The Apostle John uses the metaphor of walking to describe our relationship with “truth.” He could have chosen a number of alternate descriptors – standing, sitting, running or even believing – to make his point. Why “walking in the truth?” And further, why does this bring John the greatest amount of joy? Perhaps he chose the word “walking” because it is so commonplace and natural. In fact, most of us walk without even thinking about it. It requires no special mental effort to simply walk. Perhaps this is a perfect choice of words for that very reason. There is nothing super-spiritual or lofty about it. It brings truth down into the everyday fabric of our normal lives. Walking is a part of nearly everything we do. Whether it’s walking to the refrigerator or to and from work, we would be hard pressed to find a more a more inclusive word to describe much of the activity of our lives. Walking in truth should become a natural, all-inclusive, practically unconscious reality of our day to day existence as believers in Christ. 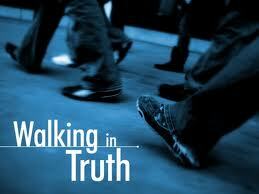 Walking in truth is not something that just happens. Infants and toddlers work very hard to progress from crawling to taking the first big step. Along the way come multiple bumps and bruises. The same is true as we develop our walk in the truth. While truth should be expressed naturally through our lives, we must determine to pursue truth. 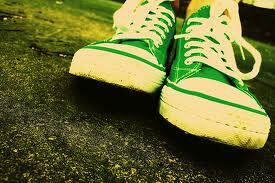 Like walking, we must pursue truth one step at a time. A parent’s joy comes in watching the walking. Imagine a child who has watched others walk, who believes in the reality of walking, and who can explain both how and why walking occurs, yet they never attempt to walk themselves! This would bring grief and concern to any parent. In similar fashion, we can know the truth and yet not walk in it. The truth is really in us only to the degree that we have learned to walk it out. Are their areas where the profession of your faith and the expression of your faith are miles apart? Are their things you acknowledge to be true but have difficulty living out? Focus on bringing feet to your faith this week! The word “church” for most people brings to mind images of brick and mortar, stained glass or pristine white steeples. But the church is not a building. Our English word “church,” when traced back to its roots, actually means “belonging to the Lord.” The church is comprised of those who have been redeemed by the precious blood of Christ and who are now gathered together for worship and warfare. This new community of believers is to be marked by an important quality which sets it apart form the rest of the world – TRUTH. Paul describes the church as “God’s household, which is the church of the living God, the pillar and foundation of the truth” (I Timothy 3:15 NIV). Foundations and pillars are critical to the long term success of any structure. A church without truth is destined for demolition. God is truth (Psalm 31:5; Isaiah 65:16), Jesus is the embodiment of truth (Ephesians 4:21; John 14:6) and the Holy Spirit is the “spirit of truth” (I John 5:6). It logically follows that Christians, those who view themselves as disciples of Christ, should seek to embody truth in the same way Jesus did. We are fortunate to be in a church culture which has consistently modeled authenticity, openness and transparency. We must diligently guard and nurture this atmosphere through the honest sharing of our lives, both the victories and the failures, so that truth is displayed before the watching world. I’ll be preaching this Sunday on the importance of telling the truth to yourself, others and to God. I hope you can join us!